Beacons are small requests that our apps make to report some information "home", to the server. Beacons are often used to report visitor stats, JS errors, performance metrics. Beacons often don't return any data back to the client, but some do. new Image().src = '/stats.png?' + qs; // "/stats.png?time=1391976334544&pixelRatio=1"
So now you want to know what's the preformance of the beacon - how long did it take to send the beacon out and get a response back. You use onload and onerror just in case you decide to return an empty "204 No Content" response from the stats.png beacon. In this case the response is not a valid image, so some browsers may decide, understandably, to fire an error event. Time from declaring you want to make a beacon request (which may be different from the time the browser actually makes it) to the time you get an event back is cool. But you know what's cooler - getting more (and more accu-rat) data. E.g. DNS resolution, connect time, etc. One lump number doesn't tell you where you should focus to improve performance. You need details. 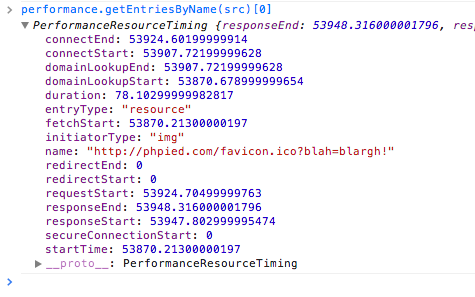 And details you get, thanks to the resource timing API now present in many-a-user-agent. Resource timing is not the same as navigation timing, but the adoption looks promising (http://caniuse.com/#feat=nav-timing). Plus, you're not going to beacon every single time. And probably perf improvements targeted at one browser will help the others (that haven't heard of resource timing yet) too. Here's a nice intro to resource timing. Alternatively, you can also use getEntriesByName(), since you have the URL, e.g. Pretty cool, huh? DNS resolution and all. All the values are relative to performance.timing.navigationStart, in case you need absolute values. Now that you know how to measure the beacon perf, you can look at the data and see where you have room for improvements. Here are some pointers to get you started. new Image().src is already async, but whatever the file where this JS code lives should be loaded asynchronously as well. The smallest response body you can have is 1x1 GIF. PNG is superior format that yields smaller file sizes, but not when it comes to tiny images. The 1x1 image should be 42 bytes. Anything above this is a waste. Switch to a 204 response and make the body 0 bytes. It's better to send the header, and flush the output first, and then do your logging. That way the client isn't waiting for you to do your back end work. Unless, of course, the response is dependent on back end work. In which case, back to the good old profiling of the craziness you're doing server-side. No network involved here. With the big axe. You may send tiny or 0-size response bodies, but what's the benefit if you send tons of headers? Cookie header being the worst. Thanks for reading! Now go make your beacons faster! And please come back and add to that list above with your discoveries.